In August 5 Peruvian FairMail teenagers travelled with 5 foreign photography amateurs high into the Peruvian cloud forest. 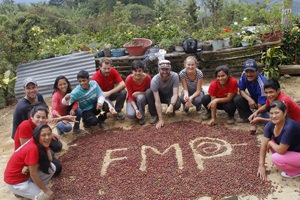 Besides taking pictures for the new FairMail cards, their goal was to learn more about the route an organic coffee bean takes from the field to the cup. To do so we started in the tiny rural village of Sicches near the border with Ecuador. This little town, situated on the humid side of the Andes, is inhabited by farmers who are members of a fair trade coffee coop. By staying with these farmers for a couple of days the teenagers learned not only about the coffee chain but also about how their fellow countrymen and -women live in a very different environment than the teenagers themselves are used to. After a few days of coffee harvesting, photo shooting and sugar cane cutting, the trip continued to the coffee processing plant. There the teenagers learned about the final stages of production before the coffee is exported to Europe. If you fancy travelling with the teenagers on one of their next trips click here or come to the next information session on the 8th of November 2014 in Rosmalen, The Netherlands. To register or for more information about the information session please click here.